Undoubtedly the most scenic and fun way to travel between Arenal and Monteverde is on horseback, crossing straight over the old mountain trails which separate the lake from the cloud forest. After leaving the town of La Fortuna, you will be driven to Lake Arenal for a boat crossing. Horses and guides will be waiting on the far shore, and it is then a four hour ride through rivers and lush forests up to the town of Monteverde. Climbing up to 3,600ft over steep mountain passes, enjoy stunning views of the lake and volcano in the east, and the pristine cloud forest to the west. The ride can also be done in the opposite direction, descending down through the forests from Monteverde to the Lake Arenal Basin. Whichever way you choose to go, this peaceful ride is makes a great alternative to a car transfer and the best way to experience the natural wonders of this part of Costa Rica at their finest. 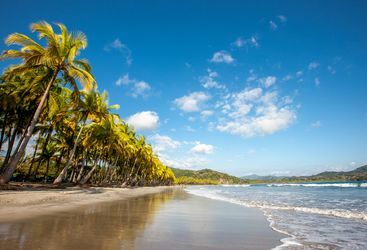 Will and Kate B are our 'Riding Safari in Costa Rica' experts and as seasoned travellers they have the inside track on the most memorable adventures.